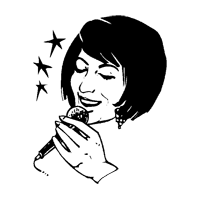 This is a guide for singing, recording, and sharing your vocal music online. Whether its singing a cover of your favorite band or one of your own songs, Voice Spice makes it easy to capture your singing using a desktop computer or mobile device, and then sharing your recording on Facebook, Twitter, and more. Before even recording your vocals, familiarize yourself with the lyrics and melody to your song. Sites such as songlyrics.com can can be useful in finding songs and brushing up on lyrics. Also listen to some recordings of the song (on YouTube or other sites) to get more ideas on how you would like to sing. Once you have found the song you would like to sing, navigate to the Voice Spice Online Recorder: voicespice.com. Ensure that you have your microphone plugged in and active. For more information on setting up your microphone, refer to this guide: on how to configure the microphone. Next, take a breath, relax, and focus on the lyrics of the song, click on the "record" button and start singing after the recorder gives you the message that it is "recording...". You should see the volume meters move while you are singing, indicating that Voice Spice is recording properly. Once you have finished singing the song, click on the "stop" button. Microphones make a huge difference in how good you will sound in your song. It's good to invest in a decent quality noise-cancelling microphone. Some brands that are better for recording on a computer include Plantronics, Sennheiser. Other nice and inexpensive microphones to consider include brands such as Snowball, CAD, Samson, Audio-Technica. Relax and have fun! Being put on the spot to sing a song can be a stressful experience. It doesn't have to be that way. Take time to relax before you sing. Don't worry about getting everying right with your vocals. You can always make another recording if the first one doesn't turn out the way you like.